Freedom Education brings a fun and exciting literacy class to 4 and 5 year-old. Children learn the phonemic alphabet and high frequency words which provide the foundation to any successful reader. We focus on sound awareness via cued articulation, letter formation, and eye tracking skills. Affordable one hour classes filled with visual, auditory and kinaesthetic activities to support learning. Five children per class run by a highly qualified teacher – no assessment necessary, all abilities are welcome. Parental guidance and support also included. Classes simulate a gentle introduction to the classroom environment and structure. Our various books and worksheets like comprehension, spelling worksheets which are student based and are designed to be used in the classroom and at home by students. All books are a PDF which will be available once purchased. There are several options for memberships as we understand that you have come to us for different needs. Please visit our membership page to select the package that is right for you. New worksheets are added regularly and you will receive an email alert when this happens. 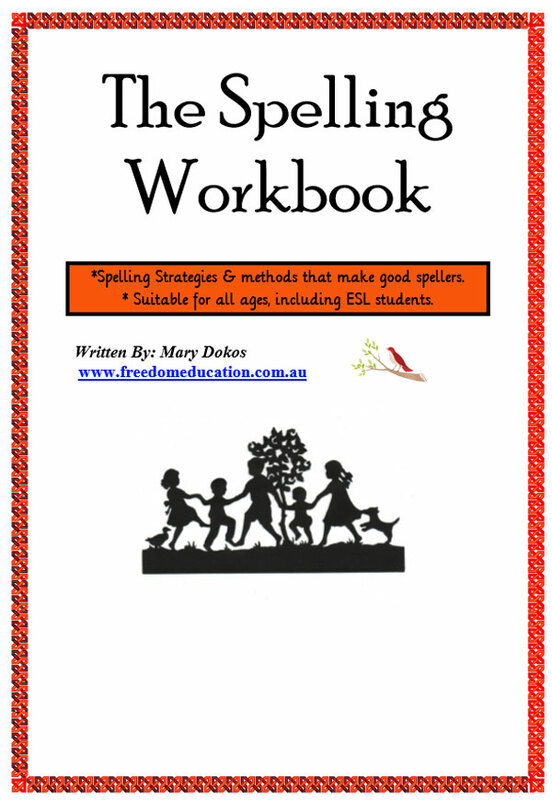 Should you have any worksheets that you would like us to create, please feel free to let us know via email: info@freedomeducation.com.au and we will attempt to produce it as soon as possible. Where and When was the education centre established? Freedom Education is located in Lower Templestowe and is privately owned and run by the director of the Freedom Education website, Mary Dokos. Although Mary has been in the education system for 14 years and has always privately tutored students throughout her many roles in education, the Freedom Education centre is brand new and consists of all updated computers, software and educational resources. It is a warm and welcoming place where Mary has the opportunity to execute all her knowledge about learning. What is the philosophy behind the Freedom Education’s Centre? Unlike the typical “tutor” centre, Mary takes on a very proactive role in every child’s learning. Apart from the initial assessment, students undergo regular assessments to ensure that progress is being made. Mary also consults with parents on a weekly basis about the progress of their child, what was done in class and any further observations she noticed. Mary also encourages parents to inform their school about the tutoring (if needed) and is happy to liaise with schools about student needs or student progress. In addition, students are taught at an instructional level (a level above their current understanding) because it is at this level that they learn new things. All new concepts are taught on a one to one basis. This means, that even though we have small group sessions (no more than 4), we do not do group tutoring. Furthermore, Mary plans each child’s lesson on a weekly basis and writes most of the material herself. Each child has their own file and their progress, their activities for the lesson and any observations during the session are extensively documented. Homework is a flexible part of the session. However, even when homework is administered, it is only based on what the child has done during the session and revision of past concepts. Can my child bring school homework to Freedom Education? YES! Many of our students do bring their homework to sessions. Again, because everyone works at their own pace, on their own program, there is much flexibility throughout the session. Mary will normally ask students if there is anything that came up at school that they may have struggled with and Mary is happy go through any student queries. How does Mary assist students with varying needs? In order to assist the needs of every student Mary has trained in many different areas and continues to undertake courses and research for new learning needs that may arise. Mary takes a linguistic approach to teaching and offers students many different programs, many of which are aligned with current speech pathologist and other educational specialists. Throughout her experience Mary has found that students excel when they are provided with an individual learning plan that is systematic in its introduction of new material but also flexible and at times incidental. Is this tutor centre right for my child? The students that come to see Mary vary in age and ability. Whilst some children do have a learning disability (dyslexia, language disorder, auditory processing, short term memory, working memory, asburgers, ADHD), others are typical mainstream students who just seem to be underperforming for no apparent reason. On the other end of the spectrum Mary works with accelerated students who are not being challenged at school. In addition to primary school tutoring Mary also tutors VCE students in English, ESL, Literature and English Language. The VCE tutoring is designed to follow each child’s school texts and support their understanding of VCE English through additional notes, essay practice, feedback, emailing and phone support through the week.